Woodman Associates was asked to develop a consensus plan that maximized the number of residential units possible in a vacant brownfield site owned by the City of Newburyport. The 1.3-acre site is in the center of a dense residential neighborhood, which had organized to resist change and more development. 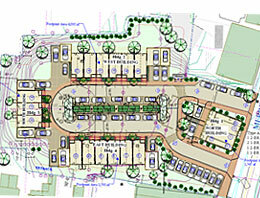 The Planning Process involved several parts including: identifying the various interest groups and their issues of concern, determining the housing and mixed-use needs by identifying and interviewing potential buyers & renters, and educating the public regarding possibilities for the site. The next phase involved coalition building and identifying and enlisting advocates for the project. Finally, it was critical to establish the financial feasibility of the project. Woodman Associates was tasked to present a plan that made economic sense, to solicit input from potential private and not-for-profit developers, and also to promote the project among the potential development community. 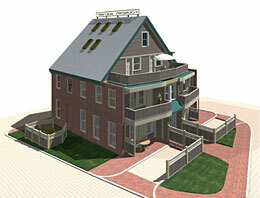 The project was approved and the interest groups felt a sense of positive accomplishment by participating in the design process that would restore the fabric of the neighborhood, provide for needed affordable housing, and revitalize a derelict site for the social, historic and economic benefit of Newburyport.